HRH Sheikh Rashid Bin Humid Al Nuaimi شيخ حميد بن راشد النعيمي‎ of Ajman, the smallest emirate in the United Arab Emirates has a son, the Crown Prince Sheikh Ammar bin Humaid Al Nuaimi. He is one seriously cool guy. He is into the standard Arabian princely endeavours such as falconary, camels, horses, especially Arbian show horses, jet aircraft, boats and super cars. 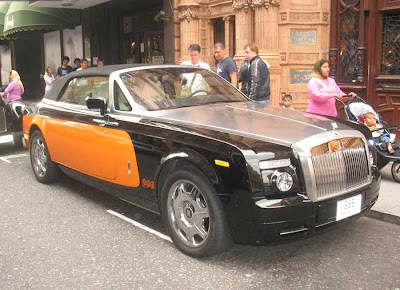 His cars are ever so slightly distinctive, due to having the marking "RRR" on them in orange, and generally come in two tone orange and black. 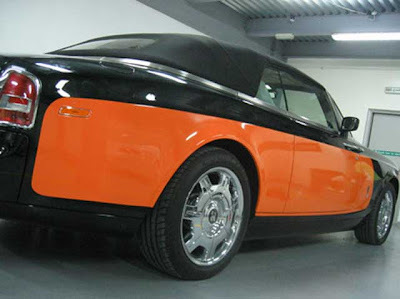 Read more about the Prince with photos of some cars in a previous post here. Sheikh Ammar is a fan of Mansory. 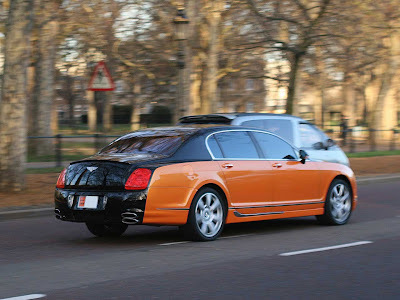 It is presumed that the first Bentley Continential GT LE MANSory widebody when to him. The colours kind of match. 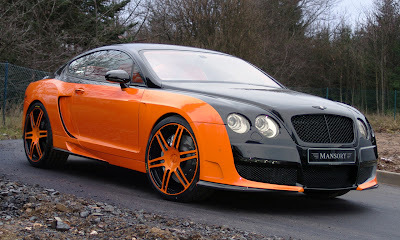 Here is another of Ammar's cars, a Mansory Bentley Continential Flying Spur in the distinctive orange and black two tone. 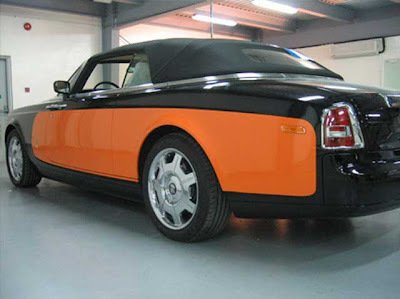 Now for the purists, the colour is not as bad as one might first imagine it to be. 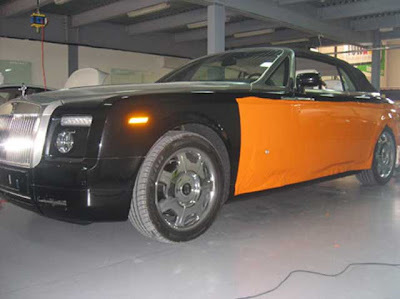 The orange is not painted on, it is simply plastic contact wrap that is stuck onto the car. 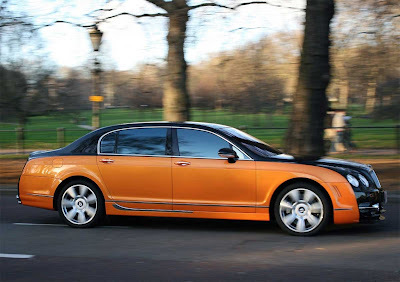 It unusually might even protect the paint from chips and exposure. What is a little surprising is that this servious of photographs have appeared on the internet. 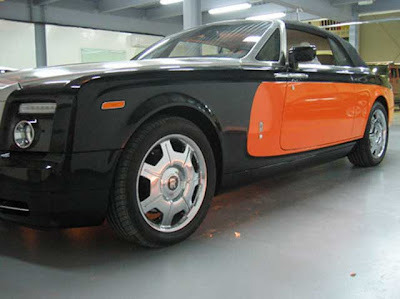 It is a gentelman sticking on the orange plastic wrap to Sheikh Ammar's Rolls Royce Phantom Drop Head Coupe. Firstly the orange contact wrap is just stuck on. Then it is ever so carefully cut to size. Peel off the excess, and you have simple, but very effective personalised car markings. 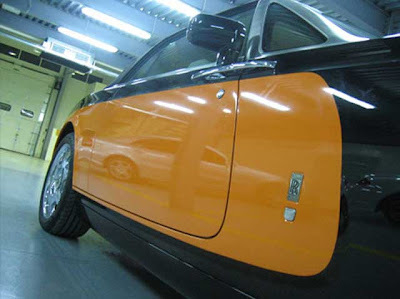 It certainly is a little easier than painting a proper two tone car. And a little easier the revert back to the standard colour for the next owner. 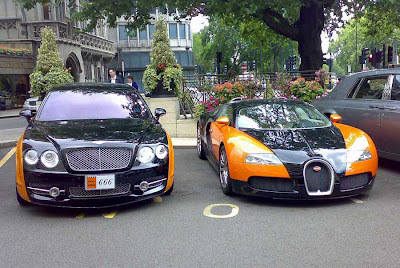 Sheikh Ammar does this to many of his cars, and the colours are even used his helicopter, boat, sports bike and clothes. It is quite distinctive branding and promotion of the Ajman emirate. If that was the intent that is. But that is probably a little to deep. It could be just because its looks cool! Here is the DHC on the streets of London.